Once the blistering cold weather goes away, most homeowners instinctively want to step outside and bask in some much-needed sunshine. For many of us, our home is the most ideal place to relax and enjoy the fresh spring landscape. If such is the case for you, then you may need to think about upgrading your patio space to optimize it for the new season. If it’s been a while since you paid any sort of attention to your outdoor living space, it may seem a little dull and lifeless after the long winter. Don’t fret, though; there are many ways to your backyard into an awesome extension of your home. Below are landscape ideas to spruce up your patio. Adding brightly-colored rugs and throw pillows to your patio can make a huge difference in your landscape aesthetic. What’s more, these are nice, homey touches that can make your outdoor space feel like an extension of your indoor living area. You can buy different outdoor rugs at your local home improvement store. They come in a variety of styles and colors and are capable of withstanding outside conditions. Aside from changing the overall look of your outdoor space, lights add security and safety at night. More and more homeowners are choosing LED lights because of their cost-efficiency. Although they are sold at an expensive upfront price, they save more money in the long run by consuming 90% less energy. Another lighting option for your patio landscape is solar lanterns. These small lights can be placed in jars to provide ambient lighting, even to the smallest of outdoor living spaces. Does your landscape seem a little underwhelming? Consider adding a water feature. 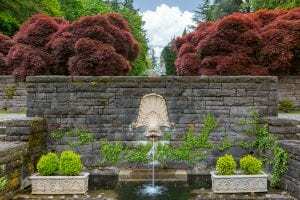 Usually made of fiberglass and/or concrete, water features make for an excellent focal point (think fountains, small ponds, waterfalls, etc.). Rock column fountains in particular are becoming more popular these days thanks to the fact that they’re easy to install and quite low-maintenance. They are also safe for kids to be around because they don’t have standing water in them. Once your water feature is installed, you can tie the whole landscape together with flowering pants. Upgrading the usual poured-concrete patio can be done by using concrete pavers. They aren’t as expensive as other materials and they come in a wide range of colors, sizes, and shapes. An advantage of using pavers is that they’re cheaper to repair in comparison to a concrete slab. For instance, if your paver has a crack or stain, you can replace it or simply turn it over, depending on the kind of paver you have. A fire pit and some comfy furniture can transform your dull patio into an inviting place for your visitors. If a traditional, open wood fire pit is not allowed in your city, you have the choice of getting a natural gas fire pit that produces fire instantly. Updating your patio and spring landscape within a specific budget is attainable as long as you know your options. Ready to take your outdoor living space to the next level? Call AJ’s Landscaping today to get in touch with our skilled team who can help you achieve your patio makeover plans.